As we wrap up milkshake week, I couldn’t end the week without another quintessential summertime dessert spun into a milkshake. Nothing screams summer like toasting marshmallows over an open flame. I remember during the summer months when my parents would grill dinner on our black Weber charcoal grill. I always knew that for dessert we were bound to have s’mores. I would eat my dinner as quick as possible in anticipation of an ooeey-gooey s’more. That’s right folks. I’d like to introduce to you s’mores milkshakes. 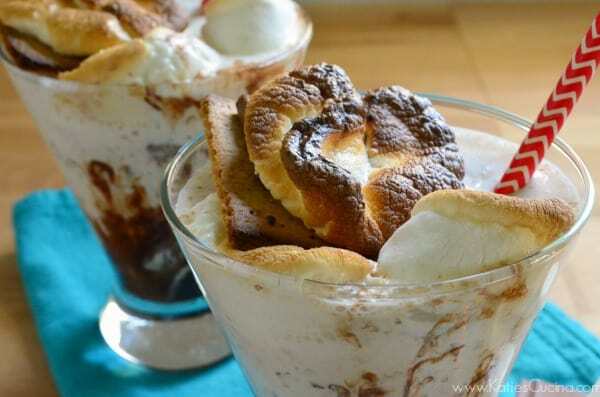 Don’t worry you won’t have to fire up your grill to make this s’mores milkshake. You can if you want too or you can just turn your broiler on for a hot minute… get it (pun totally intended). That’s what I choose to do. I cranked up my oven (I know… in the middle of summer in Florida I’m cranking up the oven–I’ve lost my mind, clearly). But trust me it was totally worth the kitchen being hot for a good half hour… and just think the reward is that you can cool off with a s’mores milkshake! I blended one Hershey bar in with the vanilla milkshake batter, and then added some toasted marshmallows and one full s’more for good measure. You blend this milkshake for a whopping 15 seconds at most. I have a high power blender… so if your blender doesn’t have the gusto like mine… crank it up until you feel fit. Because you can never have enough chocolate I also drizzled some chocolate syrup in the glasses before pouring the s’mores milkshakes. Beat the heat this summer and drink up a s’mores milkshake! While oven is heating, place 10 marshmallows on a baking sheet covered with aluminum foil. Then add 3 graham crackers, chocolate from half a chocolate bar, and 3 marshmallows on top (you should have 3 s'mores). Broil on high for 30-seconds to 1 minute until marshmallow is toasty. Remove from oven and let cool. In a blender, add vanilla ice cream, whole milk, and 1 chocolate bar. Blend for 10 seconds. Then add in 6 toasted marshmallows, and one s'more. Pulse 5 times until just incorporated. 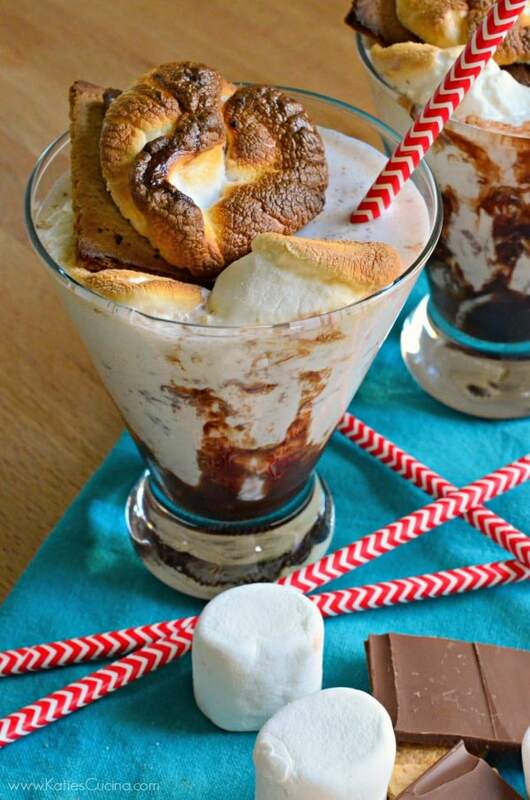 Drizzle chocolate syrup in glasses, then divide the s'mores milkshake batter between both glasses. Top with 2 toasted marshmallows and one full s'more. Enjoy immediately. Oh my gosh!! WHy didn’t I add chocolate and graham crackers to mine too?? SO SMART! 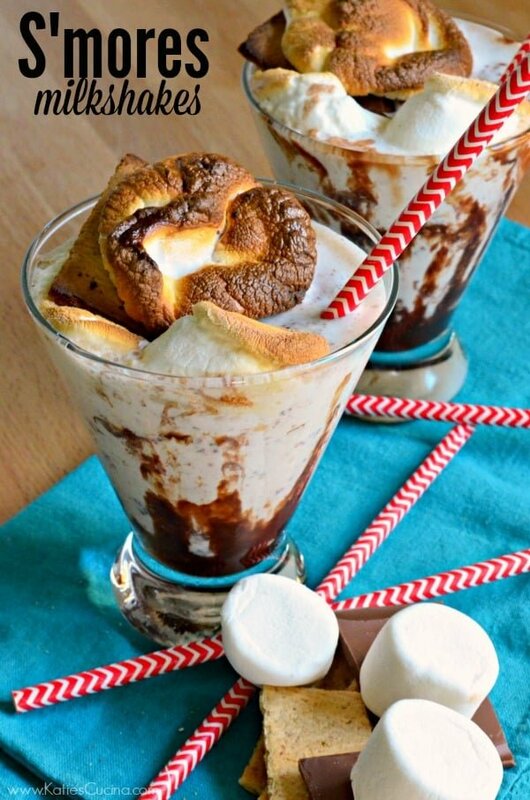 lol… just an excuse to make another s’mores milkshake! YEAH! S’mores milkshake club, unite! These look fantastic! I love that we all did our own thang with the s’mores concept. Yours looks so delicious! I think we all have s’mores on the mind, Rebecca! Smores are PROBABLY my favorite part of summer. I am seriously drooling over these milkshakes right now! Mine too and yet this was my first of the summer! MY KIND OF MILKSHAKE!!! 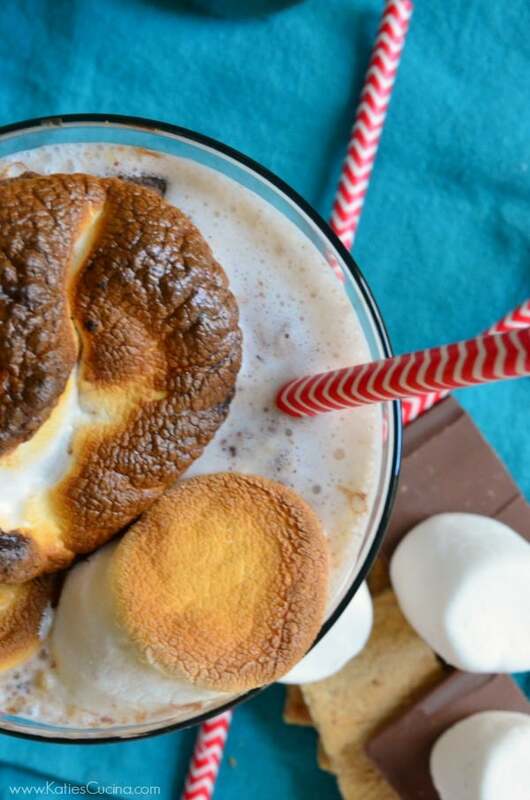 S’mores are just the bessssst and this milkshake totally lives up to that! Kayle I haven’t had a s’more in forever… it was so good! Instead of firing up the broiler my husband used his Map torch (mens version of a brule’ torch) and toasted the marshmallows. Worked just as well. Love the alternative way to toast the marshmallows! Glad you enjoyed it! This recipe is looks so delicious – thanks KATIE! Pingback: Summer Drinks: Family Friendly & Delicious!